ISO 128 is an international standard (ISO), about the general principles of presentation in technical drawings, specifically the graphical representation of objects on technical drawings. Since 2003 the ISO 128 standard contains twelve parts, which were initiated between 1996 and 2003. It starts with a summary of the general rules for the execution and structure of technical drawings. Further it describes basic conventions for lines, views, cuts and sections, and different types of engineering drawings, such as those for mechanical engineering, architecture, civil engineering, and shipbuilding. It is applicable to both manual and computer-based drawings, but it is not applicable to three-dimensional CAD models. The ISO 128 replaced the previous DIN 6 standard for drawings, projections and views, which was first published in 1922 and updated in 1950 and 1968. ISO 128 itself was first published in 1982, contained 15 pages and "specified the general principles of presentation to be applied to technical drawings following the orthographic projection methods". Several parts of this standard have been updated individually. The last parts and the standard as a whole were withdrawn by the ISO in 2001. A thirteenth part was added in 2013. 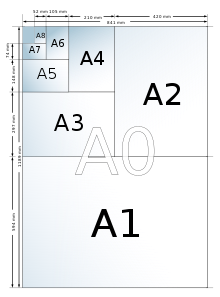 A size chart illustrating the ISO A series described in ISO 216. ^ a b ISO 128-1:2003 Abstract. Accessed 1 March 2009.